Your data is priceless... Backup them! Copy your disk: Create a bootable copy of your disk updated regularly and automatically. You can restart from the copy at any time and retrieve all your data and applications in your usual environment. This function is also useful to change your startup disk or to duplicate an environment on multiple machines. Clean Mac: Put your Mac in good condition by using a clean copy of your startup disk.You can directly restart from the clean copy or restore your internal disk. Save your data: Tri-BACKUP automatically and regularly copies your files to one or more internal or external drives, on another machine, network, FTP server, etc. You can multiply your backups to increase the security of your data. Data recovery: If you lose your data, backups will be much more effective than any data recovery software. Think backup with Tri-BACKUP. Transfers your data : Synchronize multiple machines, share files and group documents from multiple users, across a local network or through external drives, and you can even use systems like Dropbox updated by Tri-BACKUP. Automate your backups : Let your backups run automatically in the background without disturbing you or slow down the use of your machine. Programmed actions can be triggered at the time and frequency of your choice, or automatically executed when a disk is connected, or when you quit an application. Compare and control: With the immediate actions of Tri-BACKUP, you compare the contents of two folders and you can control exactly what needs to be copied, synchronized or deleted. Survey: Survey the contents of a folder or disk to detect any modification and warn or execute an action. 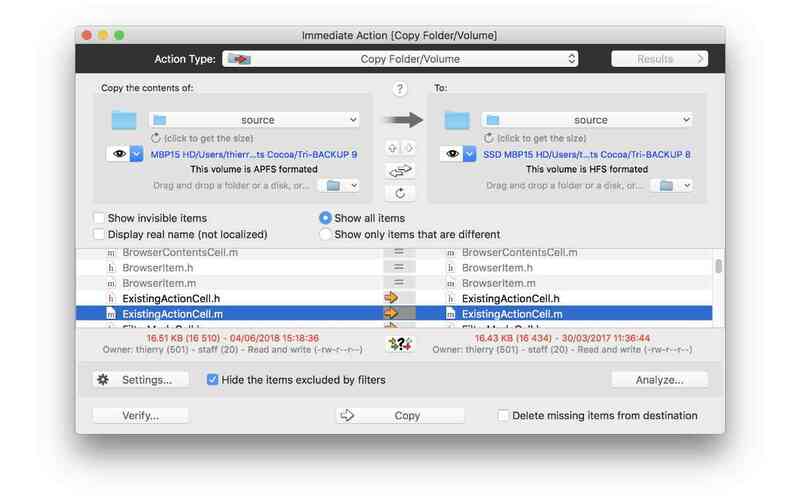 Copy and organize: Copy the contents of a folder by sorting the files in subfolders following their date, their kind (images, video...), their extension, etc. Save your data is of paramount importance if you consider that your data has some significance. A computer or a disk can fail, data can be accidentally destroyed, a computer can be stolen or destroyed in a fire. Whether personal or professional, some data is irreplaceable and will never be possible to reconstruct if lost: photos of a particular event, documents created by you, etc..
Tri-BACKUP lets you protect your data from a single copy on an external drive to a set of actions to backup on different medias that you can keep in different locations for maximum security (including backups on the internet) . With Tri-BACKUP, you have all the tools to easily set up your backups and monitor the proper implementation. With all its many possibilities, you can create a backup system exactly right for you. Programmed actions are made to perform the backup job. You can create multiple programmed actions by using the various modes available to you. You can save a file or copy an entire disk, synchronize two folders, etc.. Programmed actions retain your settings and run when you choose, or are triggered at special events (when you connect a drive, you leave an application, etc.). Of course, you can choose to start any of your programmed actions manually at the time of your choice. Immediate actions let you check and compare, but also perform a specific operation. Immediate actions to copy or sync display the contents of records or records showing the differences. You can review and analyze the differences, but also choose what to copy, delete elements, etc..
You can use the filters to exclude certain items and options to adapt the action for you. When a backup (or copy) has already been performed, Tri-BACKUP then copies only the changed items, without wasting time copying again what does not need to be. You can also add filters to your actions to exclude certain folders or files that you do not need, and limit the space occupied and the execution time. Once your actions created, Tri-BACKUP is in charge of run them in the background without interfering with your work or slowing down your computer. Your data will be regularly backed up. If desired, Tri-BACKUP update an exact copy of your boot drive so that if something goes wrong, you can continue working on the copy keeping your usual environment, your settings, data and applications. When necessary, a backup tool must help you to restore your data as simply and efficiently as possible. 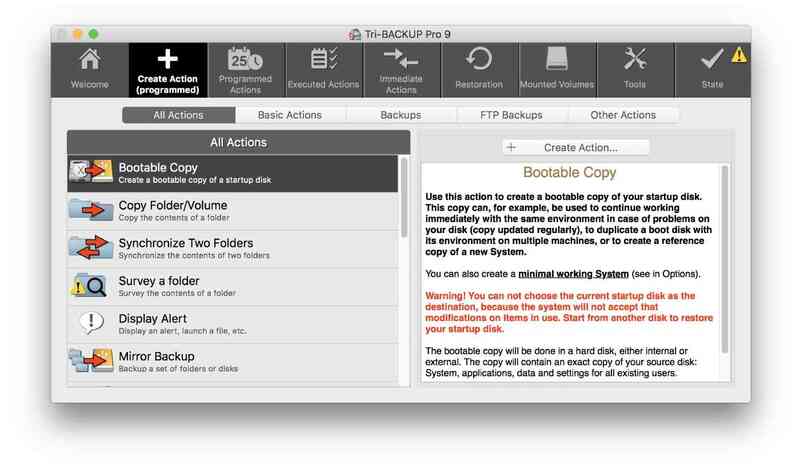 From the Finder: Tri-BACKUP backs up your data by replicating the folders hierarchy. So you can retrieve files directly from the Finder without using Tri-BACKUP. Looking for the most recent backup: Tri-BACKUP tells you what action has recently saved a particular file, and where. You can easily get the latest version. Time Machine backups: Tri-BACKUP also allows you to compare and retrieve data that was backed up by Time Machine, while benefiting from the filters and options of the Tri-BACKUP actions. Tri-BACKUP can restore an entire disk as well as a particular folder. Minimum system: create a bootable with a minimal system disk, to create a rescue disk, for example on a USB stick. Duplicate a partition map: create a new disc with the same partitions as an existing drive to easily make a copy of a disk organization. Copy hidden partitions: Mac disks can contain hidden system partitions that are never mounted. You can directly copy these partitions. Recovery HD: you can recreate a Recovery HD partition for Mac OS X.
Tri-BACKUP is also available in Pro version, which adds specific functions such as backup to web server, control the actions from another machine, double checking of copy, or sending e-mail alerts (for example, to send email to an administrator when errors were detected, or to monitor the proper implementation of backups). What is new in Tri-BACKUP 9? Version 9 is a brand new version of Tri-BACKUP for Mac OS X 10.9 or more. - New programmed action "Copy and Organize". - New Survey programmed action (to survey if the contents of a folder or volume change). - New access to see the number of versions of each file saved in Evolutive Backup. - New extension filter to copy only files based on extensions (copy only image, video, audio... files). - New "Add to Favorites" option to filter and launch more quicker your favorite actions. - Reports the number of items excluded by filters during the execution of actions. - New Suspend activity option in the Before/After operations. - Many new options to better monitor and control your Mac and your backups. - More controls and information in the Scheduler menu. • Bootable copies, minimal system creation, partial copies, multiple filters, automatic triggers. • Multiple backup modes: Evolutive (which keeps multiple versions of each document), Mirror (identical copy), Incremental partial Disc Copy, etc. • Survey action detects any change in the contents of a folder or disk and can launch the execution of an action. • Copy and reorganize files depending of their date and extension. • "Programmed Actions" running in the background, with automatic execution. • "Immediate Actions" to check and control precisely what needs to be copied, deleted or modified. • Many tools and information modules. Trial version : a demo version is available for your testing. It is fully functional, but is limited in time.